A veteran archaeologist(Charlton Heston) in Valley of Kings, Egypt, discovers the coffin of a nasty queen ( Hatsetsupt ?) but open the tomb , the mummy’s spirit is transfered to his baby daughter (one time grown-up is played by Stephanie Zimbalist), born from his wife (Jill Townsend) at that moment. His spouse flees and Heston falls in love with his archeology’s partner(Susanna York). 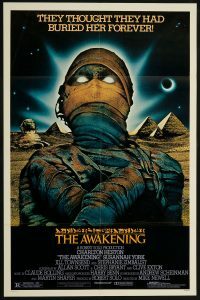 This supernatural picture based on Bram Stoker’s novel is packed with thrills, chills,suspense and wonderful outdoors from Egypt. The chief excitement lies in watching that new and innocent victim can be executed (Omen-alike) by the Egyptian mummy. The movie is full of grisly killings, terror, shocks and several eerie scenes. It displays a mysterious and sinister atmosphere, while the look is suitable spooky and frightening, the plot spreads to breaking point and the final turns out to be a bit frustrating. Appears as secondary Ian McDiarmid , today famous for his role as Chanciller Palpatine in Star Wars and Myrian Margolies who appears in Harry Potter films. Colorful cinematography by the classic Jack Cardiff and good musical score is composed by Claude Bolling. The motion picture is professionally directed by Mike Newell. He’s a nice director film-making for BB television, dramas as ¨Enchanted April¨, ¨Mona Lisa smile¨, who achieved success as ¨Donnie Brasco¨and ¨Four wedding and a funeral¨, furthermore ¨Adventures of young Indiana Jones¨ series and ¨Harry Potter and goblet fire¨,among others.The film will appeal to Charlton Heston fans and Egyptian theme fonds.